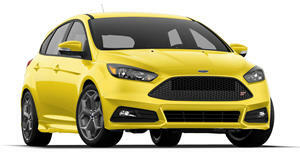 Ford has brought out another track-ready version of one of their road cars, this time based on the new Focus. Plenty of car companies offer track-ready versions of their road cars, but you&apos;d have a hard time finding a company which offers more cost-effective turnkey racecars than Ford. Following in the footsteps of such greats as the Mustang Cobra Jet and the Boss 302R is the Focus ST-R, a track-ready version of the potent Focus ST. The ST-R has all the FIA-approved safety equipment it needs, and all the customer will have to add is communications equipment and decals. Ford take care to make sure that the car is as similar to the street version of the car as practicality and race regulations allow, thus making parts easy and cheap to come by. Ford has said that a number of established privateer teams have already expressed interest in the ST-R, and if Ford&apos;s previous turnkey track cars are any indicator, this latest offering should be quite successful. Expect to see the ST-R in any number of touring car races in the near future.